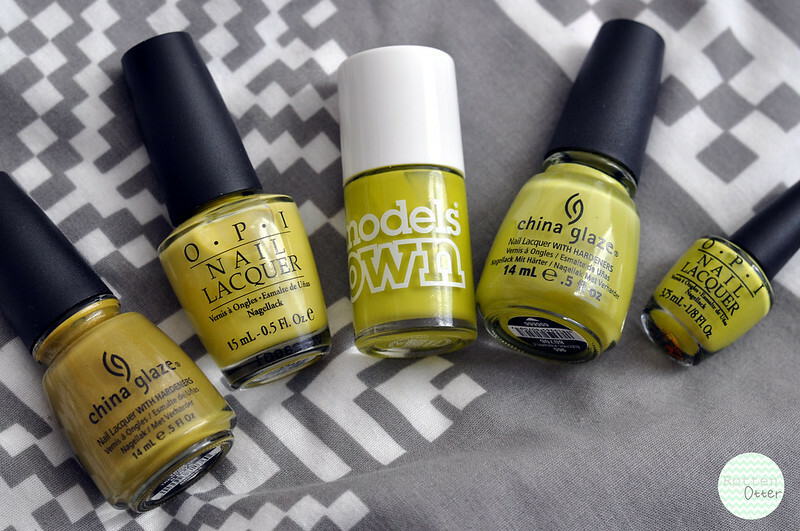 Lately I've become obsessed with yellow-green nail polishes. Most people probably hate this kind of shade but I absolutely love it. I always tend to pick the "ugly" polishes as my favourite. China Glaze Trendsetter is a bit different to the others. First of all, it contains glass flecks while the rest are creme. It's also a lot darker and has more brown in it. The formula for this one is perfect and only needs two coats. 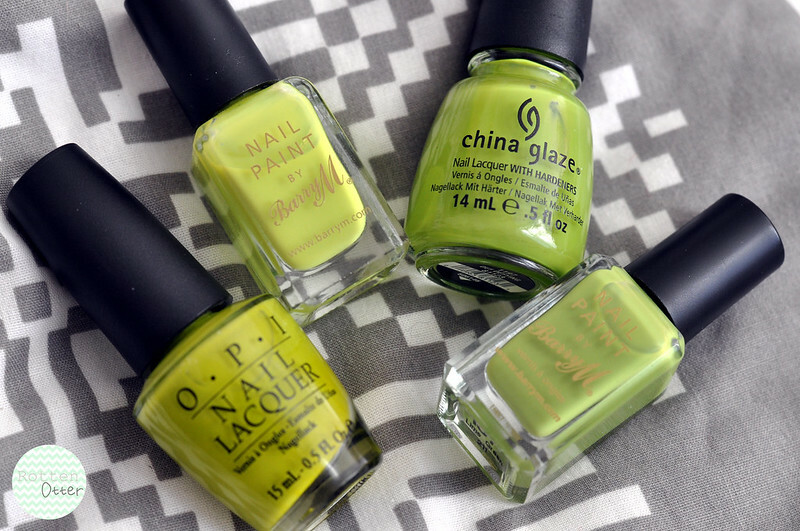 OPI Fiercely Fiona is one of the newest additions to my yellow-green family. Along with Who The Shrek Are You, I managed to get it for £5.99 from Fragrance Direct. I thought I'd have to pay £10 or more for it as the Shrek collection came out ages ago and I only just decided I needed it. This is the yellowest out of them all and reminds me of bananas. Models Own Aciiid is a pretty good dupe for OPI's Did It On Em from the Nicki Minaj collection. It's also easier to get a hold of and cheaper. China Glaze Electric Pineapple is a slightly lighter version of Did It On Em. I love pairing it with CG's Whirled Away. The only down side to Did It On Em is the formula, it does need three even coats otherwise it looks a bit streaky. OPI Who The Shrek Are You? is exactly the same shade as Shrek. OPI couldn't have chosen a better colour! This one is pretty hard to find cheaper than full price but if you want it, keep an eye out on Fragrance Direct as it might come back in stock at some point. Despite the name, Barry M Acid Yellow is definitely more green than yellow. If I'd tried this polish before buying I probably wouldn't have bothered as the formula is pretty poor. I thought I'd still include it but it's streaky after three coats. China Glaze Def Defying is the greenest out of them all. Like all the other CG polishes I've featured, the formula is pretty much perfect. Opaque in two coats, dries glossy and quickly. This is another one I like to pair Whirled Away with. And finally Barry M Lime Green looks like a pretty good dupe of Def Defying in the bottle but once on the nails it's definitely different. Lime Green is sheerer so looks a lot lighter. This is another one that needs at least three coats. That's a lot of 'ugly'. ;) I think I may have one shade like this, but I am not a particular fan. I think they can look really nice with gold finishes or on a toes in the summer. I love these polishes, especially Electric Pineapple! They're not ugly at all!